Hi, I hope you are well and thanks for all of your awesome help in telling our story of Himalayan mountain climbing and trekking. I am in Kathmandu now, its warm and dry and calm. In fact, the weather is unusually good for this season, when in years past it has been cold and rainy at this time. It seems they have been having an unexpectedly warm and dry climate for the last 18 months or so. One could even characterize it as a drought. Is the old global warning beginning to make its mark? On the flight in yesterday, I saw a surprisingly clear view of Nepal's 8000 metre peaks, seen from east to west: Kangchenjunga (3rd highest mountain in the world), Makalu (5th highest), Lhotse (4th highest), Everest (1st highest), and Cho Oyu (6th highest). I think it was one of the best airplane views I have ever had of the Himalaya. We thought we could see Pumori (our current objective), but were not sure, as from our perspective flying up at 9000 metres above India and Nepal, Pumori is relatively dwarfed by the sea of peaks around it. Here in Kathmandu, it has just been Buddhist New Year and the famous Hindu Shivaratri festival all at the same time, so everyone looks relaxed and happy, and it appears not much work is getting done. It might be even more laid back than usual. On the drive in from the airport yesterday, we saw quite a few groups of people parading around, waving flags, holding banners, chanting, praying, and playing music. Nepal may be having political struggles, but its certainly not very apparent when you wander around the streets of Kathmandu. In one busy section of town where many people were out on the street, our driver and local agent, who is himself from one of Kathmandu's old established families, pointed out several foreign dignitaries wandering around in the streets, probably walking to have their lunch at a famous 5 star hotel restaurant in the embassy district. This small group of mainly white men in suits and ties looked a bit out of place next to the Nepalis wearing their Saris and Dotis and carrying handbags filled with vegetables, going about their business. The dignitaries were walking slowly, gesturing and laughing. In the group, our driver, who seems to know all of these people, pointed out several top level embassy staff. We did not see anything that looked like a policeman, security, or body guard within a half kilometre of them. Either the embassy officials on their lunch break were walking with security agents who were extremely well camouflaged as being very relaxed, smiling and laughing and enjoying the day, or they were feeling quite calm about the Nepal security situation at the moment. That may seem a bit of an unexpected surprise, as these same embassies have been busy crafting frightening announcements to folks back at home warning them that Kathmandu is unsafe. Do you suppose that is their day job; to please the folks back at home hungry for bad news, and when they are on lunch break, they just relax and enjoy life? As ever, it seems that Nepal is a country of surprising contrasts. Hi, We are currently in Tingri acclimatizing at about 4300 meters. The weather has been great. A little wind and a lot of sunshine. I have attached a photo of Deno, Myles, and Martin at the Tingri Fortress. Everest is visible in the background if you look very closely. Mr. KIPA SHERPA, chief cook, Nepal. 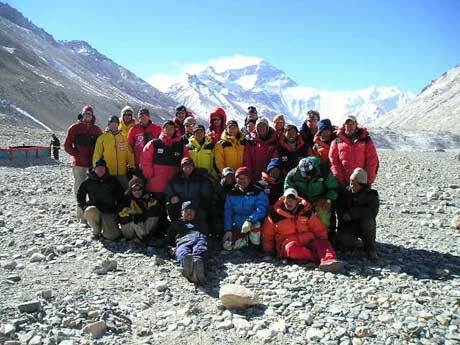 Hi, we are up here at Everest base camp, having arrived yesterday around lunch time. Everyone has been working very hard getting camp set up. Today we took a group photo in front of Everest. Will send a copy shortly. The weather has been surprisingly good. A few snow flurries this morning, then sunny with light winds for most of the day. Gorgeous stars this evening. We all seem to be healthy and comfortable so far. Thanks again for watching our expedition! Hi, Greetings all from SummitClimb Everest Tibet team. We have had some fantastic days up here at 5300 Base Camp with great weather and a beautiful view of the North face of Everest. Everyone in the team is doing extremely well. We have taken a number of days here just to chill out, get well hydrated, and the result is that all the team have acclimatised strongly, and are looking forward to moving up tomorrow to Interim Base Camp at 5800m. We'll spend a few days up there before moving higher to Advanced Base Camp (6400m) and get ourselves settled up there for a number of days before we attempt to move on up to the North Col.
Today, the yaks arrived (see picture) and there was a fair amount of towing and froing to get them all sorted and then loading the yaks with our gear to take it up to the Advanced Base Camp, lots of hilarity for all concerned! We'll find out in a few days how much of our stuff actually made it! The team is starting to really gel - good banter and getting to know each other well, which bodes well for great teamwork up higher. We all send best wishes and love to our families and friends - we'll be in touch again within a few days. Hi, Thanks a lot for covering this season's expeditions on Everest. A meeting concerning the fixing of ropes on the north side was held out at 5300 metres in the centre of the wind blasted gravel flats of BC today. The meeting was graciously hosted at the basecamp of the Chinese expedition, led by Mr. Nima Tsering. Present at the meeting were the liasion officers, leaders from several teams, including Arun Trek, the Chinese team, Himalayan Experience, Korean, Indian, Russian, and SummitClimb.com teams. Meeting attendees felt that it was a productive session and thanked Himalayan Experience for all of their hard work in the past few weeks in fixing the ropes to 7500 metres. Lots of things were sorted through, including some of the rope fixing scenarios (not always positive) of the past couple of years. Russell Brice of Himalayan Experience was very helpful, agreeable and cooperative, and spoke of working together with SummitClimb's 15 member international team and their 7 strong Tibetan and Nepalese Sherpas to fix the ropes to the top of our planet's highest mountain. This year the rope has been fixed with the very hard work of Tibetan Climbers who have been trained over successive years by a school based in Lhasa. In addition, Nepalese Sherpas have been instrumental in fixing these lines. As the route is pushed up the mountain, the teams at the meeting agreed to contribute rope, Sherpas, oxygen, and anchors. For teams who have not come prepared to contribute manpower and materials, meeting attendees agreed that $100 per foreign climber should be assessed and collected by Himalayan Experience, as they have already done so much work so far this year. Everyone at the meeting agreed that fixing rope should not be an area where profit can be earned. Daniel Mazur from SummitClimb mentioned that in 2004 and 2005, SummitClimb's teams have been ready to summit on an earlier schedule than some of the other teams, and would like to accept responsibility for fixing ropes on the upper mountain should this happen again this year. Russell Brice agreed to this in principle, but asked that Himalayan Experience's ropes be used as they are all one colour (blue with a white stripe). Mr. Brice said fixing the rope on Everest is never an easy job, and no one will ever be totally satisfied. He also stated that his team would not cut down ropes while teams were still climbing on the mountain. However, Mr. Brice and Mr. Mazur agreed that it is important to remove old ropes for safety and environmental reasons. Lets hope that this meeting we had today will open a new door on an era of cooperation which will see all of the teams working together to make a safe route up and down Mount Everest, also known as Chomolungma, and Sagarmatha, for everyone to share. Wishing everyone a succesful and safe climb. Hi, Thanks for telling the story of our Everest - Tibet climb. Today we are up here in Interim camp, halfway between Basecamp at 5200 metres and ABC at 6400 metres. We are having a rest and acclimatization day today here at 5800 metres. Yesterday we walked here from Basecamp in about 5 hours. The attached photo shows, from left, Bill Yeo, Olaf Sundstrom, sleeping tents, our large dining tent, and one of the the 20 metre-high ice pilgrims which are featured here in interim camp. These formations are unique to large glaciers near their terminus, and are formed by sun and wind erosion, over 100s of years. We are actually camped on a glacier covered with rocks. The weather is windy as expected with strong gusts but temp is not to bad and we are very cozy in our tents resting today. Kipa our cook is doing a great job. Today for lunch we had fries (chips), beans, sardines, fried veggies, with warm piaple for desert. Everone is healthy and in good spirits. Hi, As this photo shows, ours was the first tent on the north col on 16 April. Thanks to Ozark tents. Mon Tindale took this photo looking up toward camp 2 at 7500 metres. Looks like part of Neil Wells appears in this photo also. It was a great day on the Col! On with the business of the climb: we plan to attempt a trip to camp 1 on the North Col on Sunday, and then we will descend on Monday to Base Camp and the thick, rich air of 5200m and at least a 5 day break before heading back up here. Lots of love to Jen and Anna, all of my family and to the staff and students at Terry Fox Jr. High in Calgary!! Best wishes, Andrew Brash Summitclimb Everest North 2006"
Dear Readers, Having had a few fun-filled, oxygen deprived days in the freezing cold and windy conditions at ABC and above, we are safely back down luxuriating in the comforts of Everest Basecamp. So let's all catch up a bit since the last update. ABC as described by Andrew in the last dispatch was right on the money. Most of us were in a perpetual zombie state doing what was needed and nothing more. For some probably very good reason we were herded out of the relative comfort of the mess tent (if sitting on plastic barrels perched on rocks supping at lukewarm cups of tea is comfort) for some fixed line practice. This was a time to fiddle with ice cold metalwork, strapping crampons to huge boots and then struggling about 20m down from camp to the ice pinnacles on the glacier. Having got the breath back, we then hauled ourselves up a line on blue ice, teetered across the top of the glacier, then rappelled back to down to the start point. Rinse and repeat. We stopped when exhausted and headed back to the mess for a nice cup of tea and a sit down. Emboldened by our practice, we had a rest day again. The following day saw some real action and we headed for the North Col. This was our first real test and the team all did great with most reaching the camp at the North Col at 7000m. Some 400m of fixed lines have been fixed to the Col and nobody managed to miss a clip! Not only might that hurt, it's a bit of a grind to have to do it all again. After such a fun day out, it was time to head back to Everest Basecamp and the thicker air at 5200m. But first another quick Puja Ceremony. Mercifully short this time in a biting wind we were fortfied by a shot of Royal Stag whiskey (that well known and much sought after brand). Which was a great boost to starting the 24km walk to basecamp [often referred to as the: "Miracle Highway"]. That sounds a breeze, dear reader, but it actually requires a miserable tramp down the glacier on moraine, scree, ice, loose blocks and all interspersed with yak hazards Horns, big bodies, wide loads and copious and copious amounts of slippery dung). Everyone arrived back before dark safely in various states of exhaustion, some in fast times and some slow - but let's remember that this is not a race and there are no medals for speed! Having been told it would only be a simple supper, the cooks turned out a belting 3 course dinner of which there were second or thirds for anyone who wanted it! To celebrate (well it was a small victory!) a small group of the team representing the USA, UK, Canada and Colombia headed for the tea houses nearby. Now, this is a slight misnomer to be sure. Last night it was definitely a case of not so much tea house but full-on lager tent. By the time we left, we were getting strong looks from the bouncer (if that is what a man in a heavily embroided tibetan jacket and with a bad attitude is) and tired looks from the serving ladies. Which brings us to today, and the first real snowfall of the expedition. It has been blowing hard and snowing all day here. There is nothing to see across camp and we have all been busy snowproofing the tents and the like. To keep the generator running we spent some time designing and building a shelter for it from some spare tentpoles, string, wire, canvas and of course duct tape! Now for all our British readers, think of a car designed and built by British Leyland in the early 1970s. It looks ugly, it is built like a brick outhouse, it vaguely works and no-one else would want it! But it is doing the job keeping the spindrift out of vital parts and keeping this ancient laptop operating at its painfilly slow best! So that's about it for now - we remain well fed, we are finding ways to keep us amused and out of the lager tent (until the evening at least) and, most of all, we are remaining healthy and fit and keen for the challenges ahead. So until the next time, thanks for reading! Love to all friends and family - we do miss you a bit. Promise. basecamp clean-up: in case some people may be under the impression that no one cares, the local Tibetan people turned out in force today to clean-up basecamp. They carried sturdy cloth sacks purpose-made for the occasion, imprinted with the name of the National Park here, Chomolangma Nature Preserve. We were impressed as these sturdy people scoured this 2 kilometre square glacial delta plateau for every piece of rubbish. We asked what they will do with it and they said it will be resorted and packed into larger bags, then buried in a special rubbish pit in a village far below basecamp. Hi, Life in ABC. Myles and Neil and Deno sharing a cuppa during tea time in our ABC mess. You will note they were well dressed for the occasion. Thanks very much for sharing this photo with their families, loved ones, friends, colleagues, sponsors. We had an orientation and training day today in ABC. We reviewed medical equipment, and oxygen apparatus, so all members are ready to climb to the summit. This photo shows Phil Crampton (wearing mask) and Mon Tindale checking out the O2 bottle and regulator, while Hector Garcia and Juan Pablo Milana wave at the camera and Everest. Thanks a lot for following what we are trying to do! Update: Thanks for watching out for our team in the Himalaya and helping us to tell our families and loved ones and friends and colleagues about the teamwork, challenge, and excitement of climbing Everest! It was a tough climb to the North col on 16 April, cold and a bit windy, but our team was lucky to be feeling very healthy and this photo taken by Mon Tindale shows Andrew, Hector, Colin, Dawa, Ken and Myles, nearly there. Also succesful in reaching the Col were Phil, Deechen, Adin, Jangbu, and Yenden. Also approaching our first 7000 metre hurdle were, Bill, John, Martin, Olof, Lorchan, Neil, Deno, and Dan. We congratulate all of them in their great teamwork and perseverance in working together to get to 7000 metres so early in the expedition. Now its time for a well deserved rest in basecamp. The going was tough, but team member Juan Pablo Milana from Argentina made it to the North Col at 7050 metres on 16 April! Thanks for telling the story of Himalayan Climbing! "The trip is going fine so far. It's cold, snowy and windy, but we're surviving. Getting into my sleeping bag at night is a frozen experience and it takes a while to warm up. 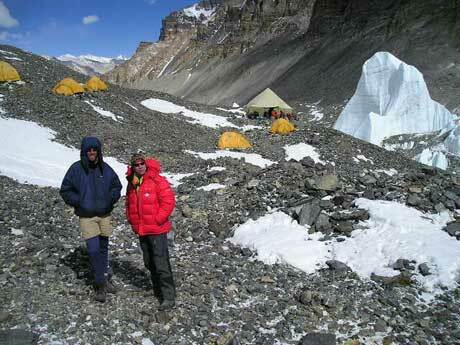 We've been to camp1 so far at 7000m or 23,000'. That's about half way up the mountain from base camp. It was an amazing feeling to finally be climbing on the mountain a few days ago...I was standing on the north col on my own looking up at the last 6000' of the climb. Wow...what a powerful thing. I really want this to succeed, but it won't be easy. The altitude is such an issue. Sleeping can be difficult with the lack of o2 - lots of hours awake each night trying to sleep.....luckily I'm fine so far...I've been reading George Orwell's Down and out in Paris and London by the way...some of you would enjoy it, but parental advisory applies!" Hi, thanks for telling our story of climbing in the Himalaya. Before getting started with our dispatch, we would like to send our condolences to those people who lost such fine sherpas in the accident in the Khumbu icefall yesterday. Arnold sent us a message when it had just happens, and we are very saddened and send our sorrow to the families, loved ones, friends, colleagues, and employers of all involved. We know what it is like to experience loss, and send our deepest condolences and support. If there is anything we can do to help, please do not hesitate to ask. we also heard a Sherpa died on this side of the mountain a few weeks ago, and we also extend our condolences and support to him and his significant others. Thank you very much. This is Andrew Brash sitting in one of the Tibetan tea houses below BC this evening, acclimatising with the assistance of Lhasa beer. Our own basecamp dining tent over the hill is cheery and warm, but we needed to come down here for a bit of atmospheric gloom before casting off up the mountain again. This will be our last glass of beer for quite some time. We're sitting under some heavy, well used blankets, a single, dingy lightbulb running off a car battery illuminating our cold corner and cutting a vague path of light through the dung-smoke filled room. Unfortunately, on Sunday, we will force ourselves to leave this place and resume our attempt to sneak up Mt. Everest, and we have plans to reach as far up as is reasonable, but will be aiming for the 8000m mark. If the weather was especially good and everything and every sherpa was perfectly in place, would we go for the summit? ... That is not the official plan at any rate. The past few days of rest following our trip to the North Col have been largely heavenly, and we have taken every opportunity to do nothing. There have been notable exceptions to the do nothing rule, of course. A movie night in BC was hugely successful, everyone enjoying many a laugh at the expense of a 40 year old virgin, thanks to John and Bill, who brought the dvd from Kathmandu (Neil Wells has christened those two great guys from Maine Bill and Ted's excellent adventure by the way)... Otherwise, activity has been restricted largely to those of a sloth. So, we will be on our way up in the morning, planning to sleep at Interim Camp, ABC, the North Col, and camp 2 at 7.900 metres, before returning here to Basecamp for another week of rest, before trying for the summit. Wish us luck, thanks for watching, and talk to us soon. Update: Dan Mazur called. Sat phone notice, so here it goes... The Everest group plans to climb up to the North col carrying a load and then come back to ABC to rest. Then we will move up into the North col area and set ready to start working toward camp 2. Update: Hi, this is Dan Mazur calling for the SummitClimb Tibet-Everest Expedition on the 27th of April. We had a snowstorm last night, it snowed about maybe 5 or 10 centimeters of snow. And today is very sunny and warm and not too windy. Yesterday nine of us went up to the North Col and carried a load up there. And, we plan on moving up to the North Col the next few days. So, wish us all the best and thanks a lot for following us. Ok, bye bye. Update 4/29/2006: Update 4/29/2006: This is Daniel Mazur from SummitClimb.com. I’m leaving a dispatch for the Everest-Tibet side expedition for the 29th of April. Everybody is doing well. We’re at the North Col Camp at 7000 meters, and we plan to take a rest day today and then carry a load up to Camp 2 at 7700 meters tomorrow, and then the following day to go up to Camp 2 and sleep there if everything goes well. Everybody is feeling really well and we’ve had some great weather lately. It seems like we have a really strong team of climbers and Sherpas and people from around the world. I’ll look forward to keeping you posted. Thanks a lot for following our expedition progress and thanks a lot to everestnews.com for letting us tell our story. Thank you very much, bye bye. Update 5/01/2006: This is Dan Mazur calling in with the SummitClimb Tibet-Everest dispatch for the first of May. We are resting today at the North Col on Everest, at 7000 meters. Yesterday we went up to 7500 meters to explore the Camp 2 area. It was a mixed day of warm sunshine and wind. We plan to rest today and then tomorrow to move up to Camp 2 and spend the night up there and hopefully do some walking and exploring towards Camp 3 up around 8000 meters. Thanks for watching the progress of our expedition and wishing you all the best of luck. Bye bye. Dear EverestNews.com. Thanks for your interest in Himalayan climbing and telling the world about what's going over here on Mount Everest. We feel very fortunate to have escaped a frightening wind-snow storm in camp 2 and returned to basecamp. Everyone in our team of members, sherpas and staff are here and all are ok. One of our most bulletproof Sherpas, Jangbu, was caught in the maelstrom for a day while trying to descend. We worried and supported him in his tough trip down. Thank the Gods he is back with us now. We plan to rest for a few days, then try again for the top. During these rest days, we have news to report about the route, expedition, camps, weather, and how things are shaping up for the season. Please just give us a moment to breath some thick air again and we will get back on the computer to let you know the latest. The North Col has been so warm. Here are Andrew, Colin and Deno lounging at 7000 metres. Dawa Sherpa is Dr. Ken Stalter's personal sherpa and Dawa is ready to summit. He wants to break new records and hopes to traverse the summit across to Tibet in the next 30 days or so, after his expedition duties for us are finished. Dorje Lama, kneeling in the tent, is our high altitude cooking expert. He is so amazing because he can whip up a simple yet excellent meal for a group of 15 with a basic assortment of kitchen supplies in a two person tent at a moments notice at 7000 metres. This guy is the toughest (Jangbu). Dorje is cooking in the tent in the background. Dawa Sherpa spotting Ken on the ladder to the North Col at 7000 metres. A spectacular spot to climb a ladder. A big hello from the shanty town that is Chinese Base Camp. A fine shanty it is however, and after 5 sleepless, clammy, ramen-noodle eating, skin-crawling, toilet-paper stormed nights on the North Col, we are luxuriating in the splendour of lawn chairs, metal tables and even the residual filth of the tin-doored dining shack here in base camp. After 10 days up and above this place, most of us are attempting to rectify our personal hygene, although for some of us this is simply a situation beyond hope. Several unSuspecting Tibetan girls were recruited to assist us with our desperate laundry dilemna. I have to admit to feeling a slight amount of guilt at the particulars I left with those poor girls...unfortunately the price of a load of laundry has gone up dramatically as a result...but back to that mountain sitting behind us - we feel relatively positive about our state of acclimatization after spending so many nights at 7000m, and I find it amazing to think that our next trip up will be to attempt to go to the top. While at the North Col most of us were able to climb to close to 7500m, with the 2 Swedes reaching 7700m. No team has camp 2 ready, that ferocious wind not allowing tents to go up quite yet. Now we plan an extended break down low, and won't return up high until mid-May. Today Dan and I toured base camp. From our modest and simple camp (Dan's words, not mine) we first visited the Chinese expedition's camp, with their multiple SUVs in the 'parking lot', television crew and star climbing team. Apparently they are preparing for some kind of Olympic spectacular for 2008. Dan and I were escorted into the 'visitors' tent, not actually meeting any of the climbers. Deciding to move on, we wandered through several deserted camps, finally entering the Russian camp. Alex were extremely hospitable and proudly toured us through their BC complex. After a quick look at the entertainment tent that included televisions and about 10 laptops online, we were treated to some boxed Australian wine in the dinning tent and had our picture taken by a certain Polish reporter. Dan amazed us all with his Russian and he and Alex realized they had met in the early 90s in Kathmandu. Finally, Alex walked us past the sauna/bath tent, without doubt an ingeneous but smelly apparatus and we walked back toward our humble camp shaking our heads. Looking out across the base camp flats and the hundreds of tents with their high tech comforts, I couldn't help but wonder what Boardman and Tasker would think of it all. After a few moments we left them behind and headed back to camp. Reliable sources reports to EverestNews.com that John Bagnulo Summited Everest, Bill Yeo did not. They used oxygen. They were climbing on the SummitClimb permit. They are currently down at ABC safe. There were at least 4 summits last night from the North. Update 5/18/2006: Hi this is Dan calling from SummitClimb Tibet-Everest Expedition. We're up here at Camp 3 at 8,300 meters. It's a little hard to breathe up here, there's not a lot of oxygen so you'll have to excuse me if this dispatch is a little bit garbled. Today is the 18th of May and this morning at a time which I don't have for you, two of our members and two of our Sherpas summitted, and we're so proud of them. That was Colin Pasey and Hector Garcia along with Norbu and Deechen. Phil and JP turned around at the Second Step, Neal stayed in Camp 3, Mon turned around before the Second Step, and they were supported by Jangbu Sherpa, who stayed in Camp 3. Update 5/22/2006: Dawa Sherpa has done the remarkable on Everest. As only Sherpas really can do, Dawa did a speed climb of Everest from the North traverses from Chinese camp to Nepal base camp in about 20 HOURS!!!!! This an unofficial time, and the time is really not important. This event again shows the remarkable ability of Sherpa climbers. A typical climb by a western climber from North to South would take a few days even by an elite climber.... WOW! People will need to figure out the starting point and ending point and times for the record books; if he used oxygen and how much, if he was helped by others as other speed climbers has been etc... All in due time. 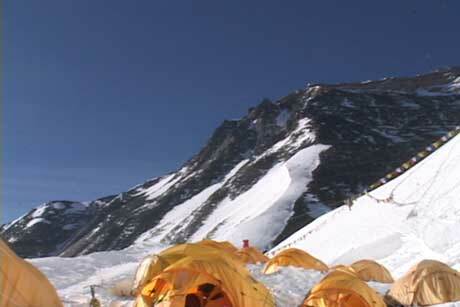 But Dawa has arrives in Nepal Base camp!!!!!!!! Don't you wish you could do that? Update 5/23/2006: Hi, this is Dan calling from the SummitClimb Tibet-Everest Expedition. And we're back up here at the North Col at 7,000 meters. We've got Andrew, Dan, Jangbu, Myles, and Phil and we're planning to go up to Camp 2 tomorrow, and if the weather lets us keep on moving up. So wish us the best of luck and we'll keep you informed. Thanks again for staying tuned to our expedition. Bye bye. Update 5/25/2006: Hello this is Dan, calling from the SummitClimb Tibet-Everest Expedition. Today is the 25th of May. We're at Camp 3 at 8,300 meters. The weather is pretty good. It's a little damp with light clouds, it's pretty warm, it's not too windy. It's about five thirty pm local time. We're planning on resting and making lots of hot drinks, and heading for the summit at eleven pm this evening. We'll keep you updated. Thanks for your support. Olof Sundstrom and Martin Letzter, two summitters who skied down the summit pyramid! Update 5/24/2006 (in America): Dan Mazur called in and left the following dispatch. : Hi, this is Dan from SummitClimb calling with the Tibet-Everest Expedition for the 28th of May. We're back in ABC. Everyone is healthy after a very dramatic attempt at the summit and rescue of a climber from another team. We will keep you updated. Thank you. Editorial Comment: The FALSE reports about Dan and his team are now in the UPI News wires in America; which means they will probably in published in 100's to 1000's of newspapers; information that is FALSE. Earlier: Dan called, "Hi this is Dan from Summitclimb, we are down from the mountain everyone is fine, everyone is safe. I am going to send a another dispatch when I get to another phone. The minutes are almost out on this phone. We did not summit. We found this guy at about 8600 meters. We gave up the summit." The connection was very bad. But we got to briefly ask Dan about reports from a fellow named Duncan Chessell, who runs a small commercial company who has an Everest expedition this year, that has announced several items in the last 24 hours without a source. This guy has reported to the world and the media that after Dan stopped at Lincoln and helped him, that Dan with another member went to the summit. “Dan with one client continued to the summit . . . nice one sunshine! Seems like more mountaineering brotherhood classes are required.” Duncan is quoted in the papers in Australia. We asked Dan did you all go for the Summit then? Dan answered, "No we went down." Dan seemed very very tired. We asked Dan about news reports, he seemed not to have heard nothing at this point. This has been a long hard year... The hardest ever... Good Night from America! Update 5/24/2006 (in America): We were able to reach Dan Mazur to ask him a few questions. This was a very brief call. Here is what Dan told EverestNews.com: When they reached Lincoln Hall, Lincoln was sitting with his legs over the Face. He was half undressed and without a hat. Lincoln's first words were, "I imagine you are surprised to see me here." Dear EverestNews.com, thanks for posting our expedition news this season. Thanks for making EverestNews.com an informative service for people who want to read about Himalayan climbing. Although we are only at May 22 on the calendar (the busiest week most years here) ABC is quickly becoming a ghost town. There are yaks everywhere, bells clanging, picking up the gear of all the expeditions that have already finished. We are down to the dregs of our expedition, the "C" team as it were. Phil, Dan, Myles and Andrew are planning to leave for camp 1 tomorrow and hope to attempt the summit on the 26th. We're a little concerned at the reports of oxygen, food, fuel, and tents being stolen from the upper camps. On our first summit attempt as part of team B, we missed the first window by a day, although two members and two sherpas from team A summitted the day before. Also, 3 members and 1 sherpa summitted in the days previous. However, those of us in team B fought our way up to camp 3 in vicious winds, and sat through the night in camp 3 in lightning, snow and high wind. We were all bitterly disappointed, and more than a few tears were shed when we had to come down, although it was a rewarding feeling helping the remaining team members from team A, who were very exhausted from the day before, back down the mountain. Now, a few of us will give this mighty Chomolangma one more try, ably supported by Jangbu, a superstar Sherpa. He is so strong that sometimes we wonder if we could be from the same species. By the way, last night, Dawa Sherpa, another superhuman kind of guy, left our camp at 11:09 pm for the summit of Everest. This afternoon we received a message that he has reached base camp in the Khumbu. What a mind boggling accomplishment. Congratulations from us all. Finally, following one day behind our "C" Team, will be the famous Swiss Guide Josette Valloton, who will try to climb without oxygen. This is an extremely rare achievement, and, as far as we know, only one other climber has survived the task this year. Also, as far as our group is aware, only one other woman has climbed Everest without O2, that being the late Alison Hargreaves. We're off to bed now, and hope to get some sleep before our last try. Our yaks have been ordered for May 29th. And we'd like to say that we really miss all you guys who have left the expedition in the last few days, we know you're probably propping up the bar at Tom and Jerry's in Kathmandu. Try not to cause too much trouble....Wish you were still here, as its always hard to say goodbye to your fellow team members who you have spent so much time with in such an amazing place, trying to climb such a looming giant of a peak. Such a big task has gelled us all into a group, and we feel like we are missing our new family. We would also like to send our deepest condolences to the families, loved ones, friends and colleagues of the climbers who have died on Everest this season. Our hearts go out to you in this sad time. We share in your feelings of sorrow and pain. This can be an unforgiving mountain, and we understand the that beside every Everest climber stands family, loved ones, friends, and colleagues, and that no climber stands alone. Once again, we reach out with respect and compassion to all of you in your tragic loss. We're ready to go back up the mountain back up the mountain, but also to return home within a couple of weeks. We miss you all at home and can't wait to see you all soon. Love and Warm Regards to all from Andrew, Dan, Myles, and Phil. Lincoln after we got the hat and glove on but before the o2. Andrew Brash has good photos of what Lincoln looked like in the very beginning when we found him. So last time we left you, Phil, Myles, Dan, Andrew and Jangbu Sherpa were at Camp 3 at 8300m on 25th May, chewing on noodles and complaining about the lack of oxygen. We left camp at 11.30pm in excellent weather that night, although it was around -30 degrees, sucking on the (thankfully) un-stolen oxygen we had at high camp. We then started a slow climb up to the North Ridge proper. It's a somewhat surreal world there; you're climbing in the small, concentrated light of a headlamp, constantly checking that your oxygen mask and regulator don't freeze, watchful of the crampons and feet of dead bodies that dot the route. The Kangshung face falls 10,000 feet to your left, and the North Face 7,000 feet to your right. Tread carefully. In the early hours of the morning we reached the foot of the First Step, the first technical pitch, glad of the warmth it generated to climb it. At this point, Phil decided to turn around; a week or so earlier, he'd saved the life of another climber suffering from cerebral oedema on 18th May by dragging him down from the Second Step at 8600m, getting some frostbite in the process, and to be honest it was astonishing that he had even made it back to this altitude in a week. And during the wee hours of a freezing morning, he made the smart call to turn himself around before he became too badly frostbitten. Sitting to our left, about two feet from a 10,000 foot drop, was a man. Not dead, not sleeping, but sitting cross leggedd, in the process of changing his shirt. He had his down suit unzipped to the waist, his arms out of the sleeves, was wearing no hat, no gloves, no sunglasses, had no oxygen mask, regulator, ice axe, oxygen, no sleeping bag, no mattress, no food nor water bottle. "I imagine you're surprised to see me here," he said. Now, this was a moment of total disbelief to us all. Here was a gentleman, apparently lucid, who had spent the night without oxygen at 8600m, without proper equipment and barely clothed. And ALIVE. We stopped and began to talk to a man who we found out was Lincoln Hall, an Australian from the Blue Mountains. It became clear that he in fact was extremely close to death in our non-medically qualified opinions; he had sustained severe frostbite in every finger, and did not want to keep his gloves or hat on. His fingers looked like ten waxy candle sticks. His head wagged and jerked around, his beady eyes embedded in a frosty face, trying to focus on something, anything. He seemed to be in deep distress, shivered uncontrollably, and kept trying to pull himself closer to the edge of the cornice, to the point that we physically held him back and eventually anchored him to the snow. Lincoln later told us that he believed that he was on a boat, not a mountain, and that he wanted to be overboard.... i.e. 10,000 feet down the Kangshung face. We fed Lincoln snacks, and hot water and juice we'd brought with us, and gave him our oxygen to breathe. We pulled all his clothes on and talked to him. Dan radioed to ABC and had our staff at SummitClimb rouse the Seven Summits team, of which Lincoln was a member. It took a while to convince them that Lincoln was still alive. They believed Lincoln to be dead, having been informed of this by a sherpa the night before. Tragically, acting on this information, the leader of Seven Summits, Alex, had already called Lincoln's family to inform them of his death. Yet they quickly sprung into action and sent a sherpa team from high camp and some from lower down to try to pull Lincoln from the mountain. Phil by this point was in high camp and assisted in informing the Seven Summits sherpas there. The entire 4 hours we spent with Lincoln, he was fairly active, and even "thrashed around" a bit. We had to take extra care to fasten him securely to the slope, as whoever had left him the night before had not tied him in to anything, and it seemed just short of a miracle that he had not fallen off the ridge during the night. Lincoln was unable to stand or speak clearly, but over a couple of hours he began to warm him up and talk. We waited for the sherpas we had requested on the radio to arrive and by 11:30 am they showed, with Lincoln's rucksack brought up from C3. We swapped oxygen sets on Lincoln (ours for theirs) and they started rigging him for the long hard trip down. Later that day he reached the North Col due to the herculean efforts of the Sherpas. But as we turned our attention back to our original morning's objective of Everest's top, we realized that time had been slipping away; we were still perhaps 3 hours from the summit, and although we were strong and eager to go on, the early afternoon storms were not far away. They could trap us high on the mountain at 2 or 3pm, probably culminating in a greater tragedy. So after years of fundraising, and months of training and climbing, we made the tough call to turn around. And as it turned out, the storms did indeed blow in that afternoon. Coming back down the ridge, to be honest feelings were of nothing but disapppointment at not making the summit; Everest is a peculiar mountain in that the summit is so highly prized and sought after, that nothing else seems important. This was made abundantly clear to us as two Italians walked by just as we found Lincoln. They increased their pace, moved on by, and said "No speak English." Although one of our compatriots at high camp had had an hour-long chat with them in English the day before. The following day Lincoln had been brought back to ABC by a massive rescue effort involving several teams. 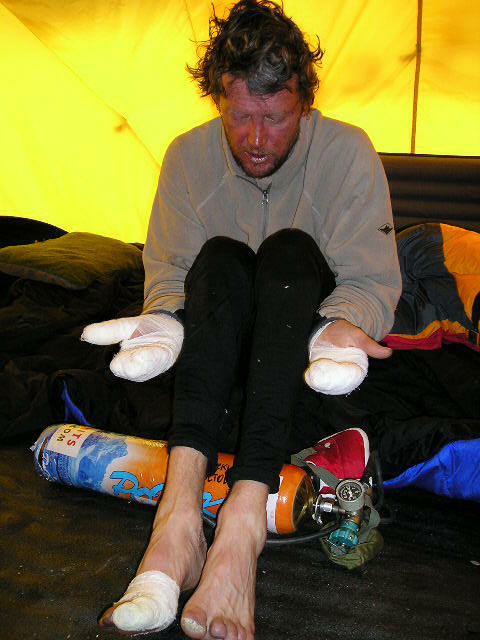 We went over to visit this man of mystery we had found at 8600 metres, in his expedition's medical tent. We reintroduced ourselves and sat there talking about his family and wife. During the conversation, I could not help but wonder, "How in ANY way is a summit more important than saving a life?" And the answer is that it isn't. But in this skewed world up here, sometimes you can be fooled into thinking that it might be. But I know that trying to sleep at night knowing that I summitted Everest and left a guy to die isn't something I ever want to do. The summit's always there after all. It's easy to be critical of the way Everest had become commercialised: sherpas dragging unfit clients to the summit and hopefully back down; teams showing up unprepared and using the oxygen and tents of others; people stealing the "Emergency Oxygen for Ecuadorian Oxygenless Ascent" bottle of a climber who only just made it down alive. We must hold on to a basic value for human life that we all hold down at sea-level and keep that in the mountains. It's something that SummitClimb's Dan Mazur and other leaders involved in this rescue remember, but that many others sacrifice for the precious summit of this mountain. Down here at ABC on Everest we're aware that there have been a lot of false or incorrect reports of goings-on up here, as well as many that might have worried friends and family. We hope that this will help settle the nerves, and we apologise for not being in touch sooner. A combination of telecommunications issues has contributed to some silence from our end, and we apologise profusely for the inconvenience. We have yaks coming to a deserted ABC on 30th May and hope to be in Kathmandu by 1st or 2nd June. We miss you at home and can't wait to see you all.